Visiting English apprentice Kieran Shoemark has started the new year with the thrill of riding his first Flemington winner. Shoemark is in his second summer stint in Melbourne with Danny O'Brien, but it was fellow Flemington trainer Stephen Brown who provided the apprentice with the winner on Harbour Grey on Friday. 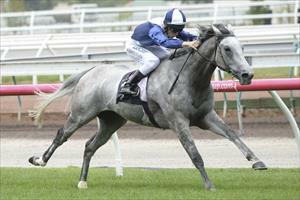 "It's my second city winner since I've been back but it's my first ever winner at Flemington. It's great," Shoemark said. "I'm based at Flemington and ride around here every single morning. I see the winning post every morning and it's a dream just to ride past it one day. "Stephen Brown has been very good to me since I've been here so big thanks to him, and the horse did the work really." Shoemark had a successful stint in Melbourne last summer before returning to the UK where he is indentured to Andrew Balding. His latest visit started with a win on the Brown-trained Kievann at Moonee Valley on November 13, while his only other winner so far this summer in Victoria had been at Kilmore at the start of December. The 19-year-old spent 2-1/2 weeks out of the saddle with a broken hand during December. Shoemark is in Melbourne until February. Harbour Grey ($5) beat Mihany ($8.50) by two lengths in the Straight Draw Handicap (1400m).